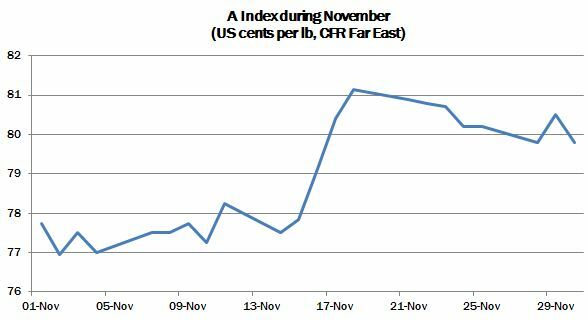 International cotton prices moved higher during November. The Cotlook A Index started the period close to its low point (77.00 US cents per lb) and advanced above 81.00 cents mid-month, before drifting lower to settle just below 80.00 cents. The upward movement was led by a rally in New York futures, which witnessed heavy trading early in the month, as funds rolled positions into the March contract, ahead of December’s first notice day on November 23. Turnover in the No. 2 contract was the third highest ever recorded in the exchange’s history on November 11. Open interest remained close to the eight-year high that was reached in October. By November 22, speculators had increased their net long margin to 40.8 percent of the open interest on that date. The firm nature of futures placed asking rates further out of the range considered acceptable by many mill buyers, with the result that volume purchases became increasingly scarce as the month progressed. Moderate levels of business were nonetheless arranged in US, Brazilian and African Franc Zone cotton, predominantly for delivery around the year-end, though pockets of demand were also noted for shipment later in 2017. Commitments of US cotton have remained considerably ahead of the pace of last season, with cumulative registered sales by November 24 standing at more than 7.25 million running bales (upland and Pima), over 2.75 million ahead of the same point in 2015. Despite resistance from mill buyers, merchants appeared to feel little pressure to discount basis levels, and instead focused on the opportunity to buy from origin presented by a rising ICE futures market. Traders added to their already considerable long positions in Australian and various West African origins, as well as Indian. At the beginning of November, India was perceived to pose the major threat to upland basis levels, as confidence in a recovery of production increased, and with it the expectation that local prices would decline as the pressure of the harvest mounted. Early in the month, ex-gin values had fallen to a level at which Indian cotton appeared to have regained its export competitiveness. The downward trend, however, was brought abruptly to a halt by the government’s currency measures (high value notes were taken out of circulation), which resulted in a dearth of liquidity, a sharp fall in the volume of seed cotton arrivals, and thus of lint production. The interruption to the local supply chain caused prices to recover sharply in the immediate aftermath of the measures. By the end of the month, the situation was said to be slowly returning to normal, but arrivals failed to reach peak daily volumes during the period, and local prices remained above the levels recorded immediately prior to the shock of ‘demonetisation’. The direction of Indian prices will no doubt be watched with interest by the international trade in the coming months, but for the time being at least, any pressure has failed to impart weakness to other upland growths. The subcontinent was witness to a further, unexpected development later in the month, as unofficial reports suggested that Pakistan had ceased issuing Import Permits for Indian cotton during the period. No formal ban was acknowledged by the Pakistan authorities, but at the end of the month shipments remained disrupted. As a result, asking rates for cotton from Pakistan’s domestic crop remained firm, and spinners with high grade requirements to cover turned to origins other than Indian. The outlook in China, though still somewhat removed from the rest of the world market, took on a more substantial appearance during November, with the confirmation that state reserve auctions will resume in March 2017 and continue through August. During the 2016 auction series, China disposed of a significant portion of its stockpile, though roughly 8.5 million tonnes of cotton still remain in government hands. 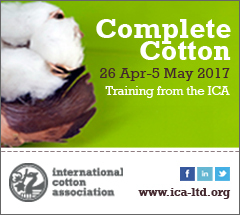 Officials reiterated that imports will continue to be limited to the WTO sanctioned 894,000 tonnes in the coming year, and though some textile enterprises have called for fewer restrictions on imports, this seems unlikely, at least until the volume of cotton in government hands has been depleted. As some observers have noted, it remains possible that China’s state reserve auctions will in the next few seasons substantially reduce the stockpile which accounts for a major portion of the global surplus and return as a major importer, thereby presenting a potentially more bullish outlook for world prices over the longer term. However, at this early juncture, little evidence exists to support a strong case for rising cotton values, and fundamentals instead continue to present a rather bearish picture. Cotlook’s November estimates of global production indicate a recovery in 2016/17, and the tight supply situation that characterised the third and fourth quarters of 2016 seems unlikely to be repeated, should no significant problems arise in major growing regions. The major changes to output during the month concerned the US, where production was increased by 79,000 tonnes (mainly owing to higher yield expectations, which more than offset the losses incurred by Hurricane Matthew in October). Smaller additions were made for African Franc Zone countries and some others, resulting in a total volume of 22,458,000 tonnes. On the consumption side, our estimate of global mill use was lowered marginally, to roughly 24,035,000 million tonnes, placing the improvement between seasons at an uninspiring 1.36 percent. 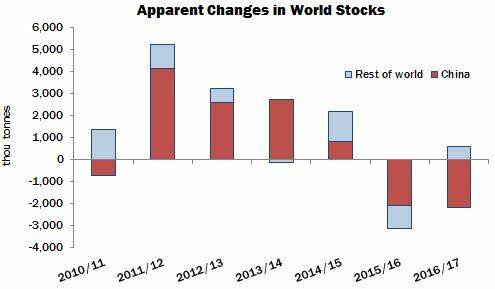 The resulting changes to world stock levels imply an addition outside China of 583,000 tonnes, significantly higher than the change put forward just a few months ago. Inside China, stocks are expected to fall by over 2.1 million tonnes.